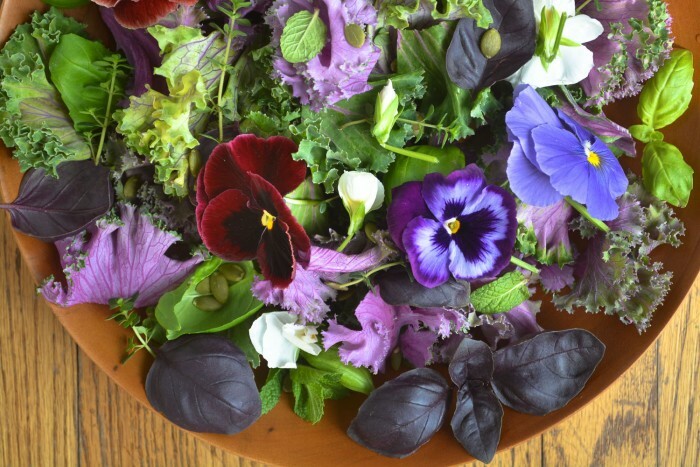 Purple Kale and Pansy Salad ~ edible flowers like colorful pansies can turn a salad from so-so to sensational. Use them as a garnish on all kinds of dishes this spring! Spring has sprung! And that calls for a celebration. It’s been a such a long tough winter for so many of us, we deserve some sun, some fresh greens, and some pretty flowers. I tossed all that together in a salad bowl for us, let’s eat! I bought the purple kale at one of our local farmer’s markets. In Los Angeles the markets run year round, but even in cold parts of the country farmer’s markets are surprisingly hardy, going late into the season and starting early. When we last lived in new Hampshire the minute the summer market ended, the winter market started up, in the gymnasium of a local high school. My daughter lives in Madison Wisconsin, and they have the largest farmer’s market in the country. She still gets her csa boxes (‘community supported agriculture’ boxes of produce from local farmers) every week. So cold weather doesn’t necessarily mean you have to forgo the luxury of local produce – do a little digging around and find out where yours is. I’m trying to get more deep leafy greens in my diet, and this purple kale called to me. Every single leaf has a different purple and green pattern, it’s just unbelievable. I’m pretty persnickety when it comes to salads. Unless they’re serving as a main course, I like to focus on the greens themselves. I don’t like to add nuts, or cheese, or lots of heavy stuff like that. For me, the whole purpose of a salad is to refresh, and it’s just not refreshing if it’s loaded with candied nuts, blue cheese, and croutons. But that’s just me. My husband loads his salads down with so much ‘stuff’ there’s no room for the lettuce! I did make one exception in this salad, I threw in some sunflower seeds or pepitas. I like the little bit of crunch they give, and I think they work really well with kale. This is more of an inspiration than a recipe, but the takeaway is this: you can make a simple green salad extra special by adding in lots of fresh herbs. And I mean lots, not just a sprinkle… I’m talking about a about a ratio of about 4 to 1 lettuce to herbs. I used thyme, mint, and fresh basil, in both the green and the purple ‘Amethyst’ varieties. If you garnish it all with a few edible flowers, even better. 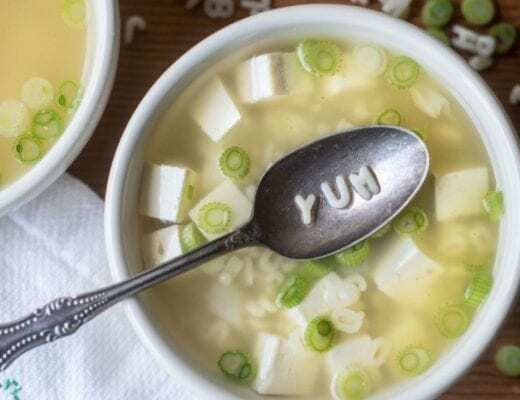 The herbs add a burst of flavor in every bite, and the flowers make it special. Lots of herbs and even edible flowers come in those little plastic clam-shell containers, and that’s great, but it’s even better if you have a backyard or a patio to grow a few herbs and edible flowers there, so you can snip them fresh. Even if you have a black thumb and they don’t survive that long, it will be more than cost effective. If you can’t grow it yourself, try the basil that comes rooted in soil, it lasts so much longer that way and it’s worth the little bit of extra cost. There is no point in garnishing a dish with a wilted herb or a less than perfect blossom, it kind of defeats the whole purpose. And just to be clear, I’m not claiming that edible flowers are the most fantastic tasting things in the world…I use them mostly for their looks, and to be perfectly honest I usually end up setting them aside on my plate. There’s nothing wrong with that. The nice thing about kale, besides the fact that it’s so healthy, is that it stands up to dressings. It keeps its crunch a good long while. 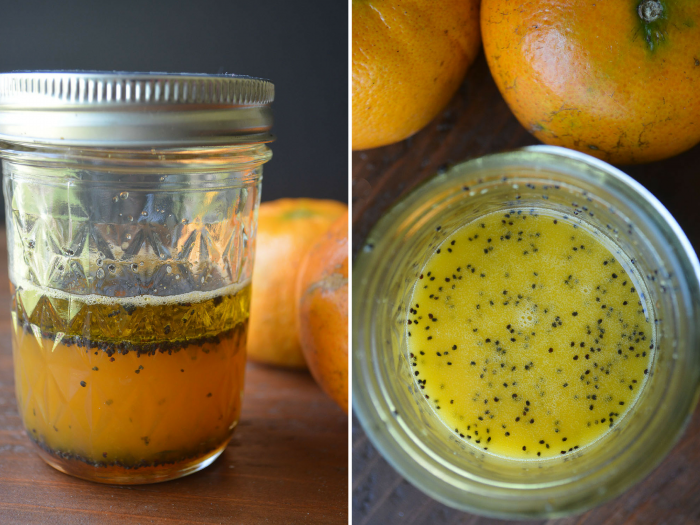 I made a fresh tangerine poppy seed vinaigrette which I think is appropriate for the first day of spring, it adds a fresh juicy ‘tang’ and a little extra crunch! If you want to bring your salad to the table fresh and pretty, put the dressing in the bottom of the bowl before you add the greens. When you are ready to serve, toss well. Kale can be a little tough. Be sure to remove the entire stem and spine from your leaves, and I like to cut or shred them fairly finely. For the photos here I left my leaves a little larger than I would ordinarily do. Some people like to ‘massage’ their kale, which is just what it sounds like, you put it in a bowl with some dressing and rub it around to soften it and encourage it to absorb some of the dressing. For more ideas on how to create gorgeous salads, see my 7 TIPS FOR SHOW STOPPING SALADS. 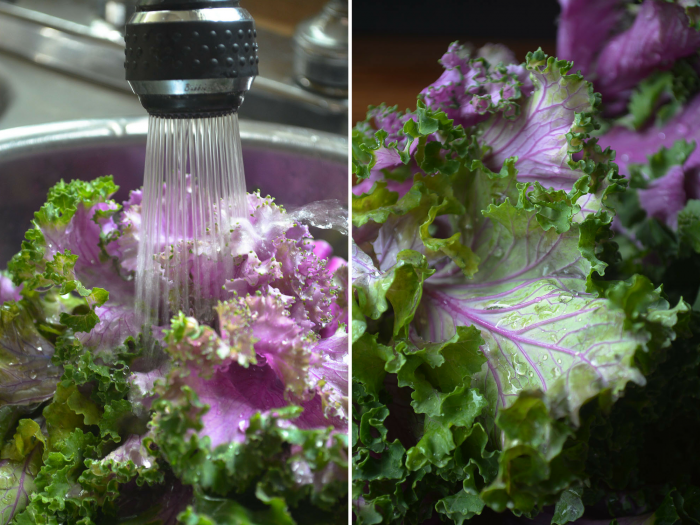 Wash your kale really well, and then trim the tough stems off. Remove the spines of each leaf, too. 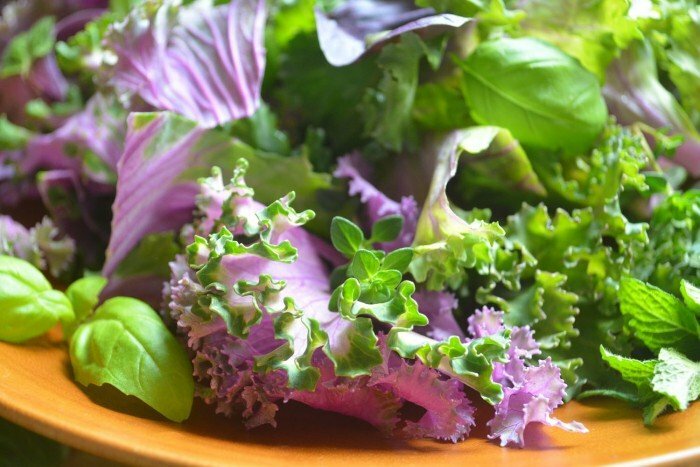 Chop or shred the kale and add it to a large wide salad bowl. Toss the herbs, onions, and seeds in, I like to keep to about a 4 to 1 ratio of greens to herbs. Go heavy on the basil. Toss the salad with the dressing, and then scatter the flowers on top for garnish. To make the dressing, put the ingredients in a jar, screw on the cap, and give a good shake. Taste it before using to adjust any of the ingredients. 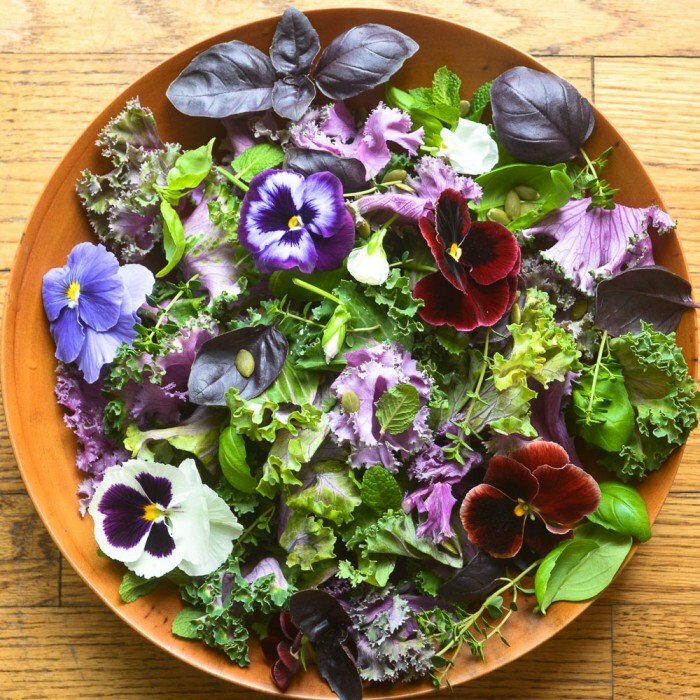 Don’t forget to pin this pretty Purple Kale and Pansy Salad! I wonder if you saw the reply on the comment. For some reason, my emails to you kept bouncing back to me. If you could send us an alternate email address so we can keep in touch, that would be lovely. 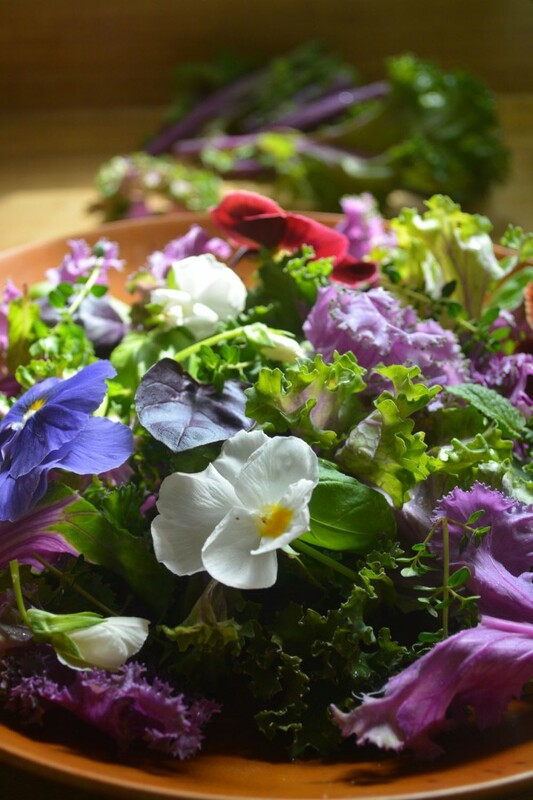 We’d love to include your Purple Kale and Pansy Salad recipe in Raw Food Magazine! 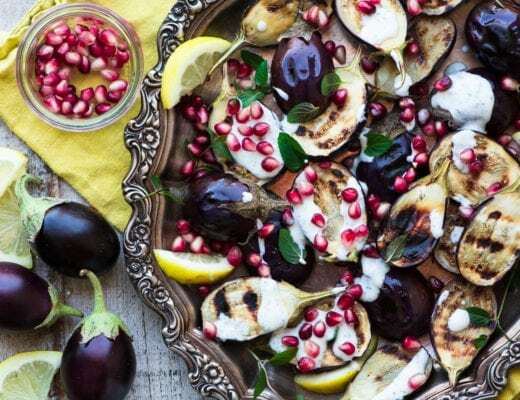 Anyway, we will have a series of Spring Suppers in the 29th issue of Raw Food Magazine, we’d love to include your Purple Kale and Pansy Salad recipe. Oh my goodness! It’s beautiful! Props to your creativity and photography! I bet I could eat a whole plate of these. Would you like to share it with our audience and give it more exposure? Your recipe page would include a direct link to your site from inside of the magazine to send traffic your way. Please let me know if you would be interested in having your work showcased in the next issue. SUPER pretty. if i ever had an urge to eat flowers, it’d be in a manner just like this. haha, it does seem odd at first, I know! Your salad is a work of art, Sue! Just gorgeous. And there you go with poppy seeds in the dressing which sounds delicious too. This is a must try! I can’t wait until we see the first pansies for sale here in Wisconsin not to mention being able to walk outside and cut fresh herbs. I had forgotten that you daughter lived in Madison! Go Badgers!! I love how bright and colorful this salad is! I always pass by the edible flowers section of the grocery store, just because I have no clue what to do with them. Trying this out for sure. And the dressing sounds heavenly. Thanks Bhiravi! I really enjoy using the flowers as accents, it makes the table so much more festive. This looks wonderful! I grow pansies every summer, but had no idea you could eat them! The dressing sounds divine too! 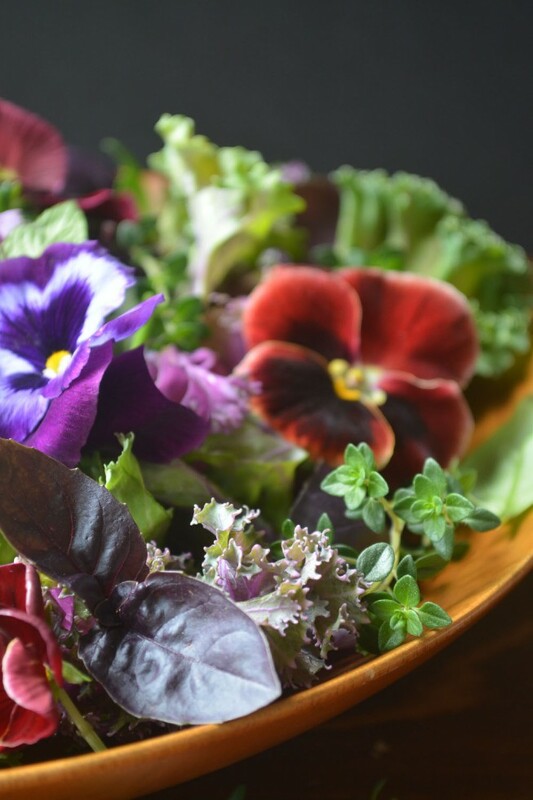 It’s perfect if you grow them yourself, you can snip a few whenever you need them, and yes, they’re one of a pretty long list of edible flowers! The combination of greens and purples is gorgeous–speaks of spring. love that you added the flowers too. things are beginning to bloom here in Nashville–we are all heartened by change of season. lovely post. So pretty and springy! I need to find some purple kale too. The colour is too gorgeous. This is gasp-worthy (in a good way of course!) The most gorgeous salad I’ve ever seen. Holy moly. I had no idea you could eat pansies. That salad looks like a work of art and I would hate to mess it up – but I would in a heartbeat. This is so stunningly beautiful, everything about it. A masterpiece, truly, wish it was spring here like it is there! That’s the nice thing about the seasons, Chantelle, you can count on them, eventually! I saw this on my iPhone yesterday and thought “that is just too pretty for words!” So now I’m trying to say with words how pretty it is and I’m a bit at a loss. Good to know it looks ok on mobile :) You are sweet, Chris! What a gorgeous salad, it looks like spring in a bowl and that tangerine dressing is a must make! This salad is beautiful and super healthy. I would even use it as a centerpiece. Thank you for this beautiful glimpse of spring! That kale is gorgeous – and can’t wait until our spring farmers market is open! Yeah~! Spring in a bowl. Looking forward to checking out the Farmers Markets when we get back to NC. 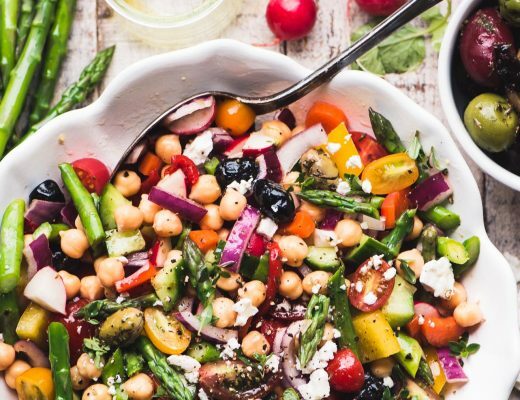 Your salad is an ode to Spring. This is the prettiest salad I’ve ever seen! I didn’t even know there was purple kale. Thank you for posting this! I knew this was going to be gorgeous so I had to pop right over. You did not let me down! I am going to be planting pansies this weekend and they are my favorite flower. In Colorado, they don’t bloom when it gets warm so they have a short season. The dressing sounds great, too! Oh Sue, what a glorious salad. What color! This would lift anyone out of the winter doldrums. And it is a treat to see that dressing. I do not know if you are old enough to remember, but poppy seed dressings were all the rage back in the sixties. So just like the song says – everything old is new again. I just love this post. Brava! I am old enough, but I didn’t know that about poppy seed dressings, my mom was a Wishbone kind of gal :) Thanks Adri! I love salad dressings, I think they really make eating salad so much more exciting. I’d love to do a cookbook all about them sometime, I’ve got to look up that papaya seed recipe! Most.beautiful.salad.ever!! 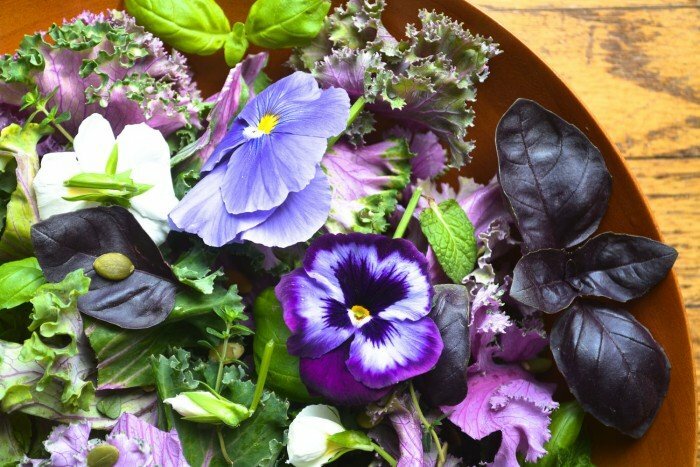 I have yet to try edible flowers, and yours are absolutely gorgeous! And that purple kale?! I’ve never seen anything like it. Just like your hubby, I’m all about adding nuts and cheese to my salads, but I can definitely see why you’d let the greens shine in this recipe! And that tangerine poppy seed dressing sounds phenomenal. To summarize: I’m in love ;) Have a great weekend, Sue! Thanks Julia — that kale was a masterpiece, I could have done a post all about that! PS I’ll be growing that sweet purple basil this summer now:)..and my pansies..Hope I can find Borage..you would like that. Borage is something I’ve never tried, but I know they have it at my local garden center, I’m going to try it! It’s the edible flower that is exquisite! Oh just the title got me..on Blogger ..and then the salad. I find salads like these works of art. Look..just nature.. and you placing it in a bowl. Your salad is beautiful, Sue, just like Springtime in a bowl. 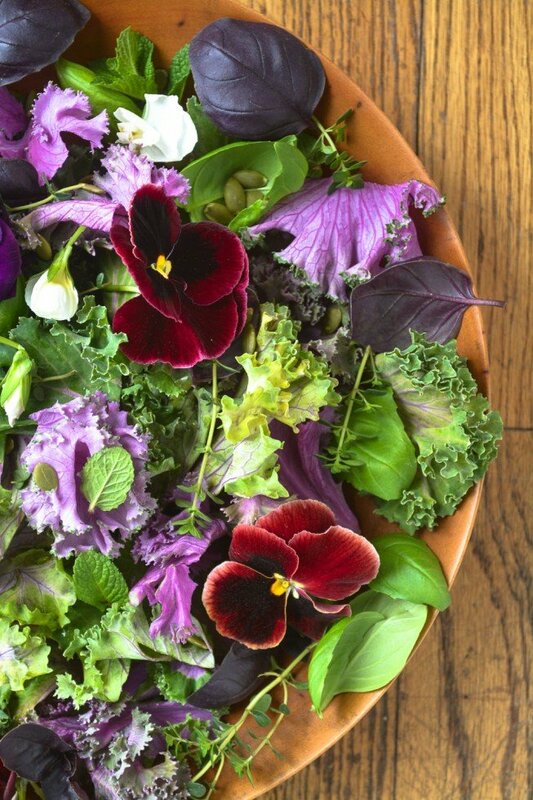 The colors of the kale are stunning with the pretty pansies. Our farmers’ market opens tomorrow and I’m hoping to find some wonderful salad fixings there. Lovely photos. Thanks Cathy. I get a little jaded with so many year round farmer’s markets, but I remember the thrill of that first market in spring, enjoy!